He had been marketing to non-profits and organizers of charity benefits, with minimal success. After consulting with All the Buzz, it was determined that Ernie was a good-looking guy and ought to put his picture on a flyer to actually show the event planner just what they were getting. The visual did the trick. He didn’t look like the stereotypical auctioneer and could represent and entertain the charitable audience quite well He had his photograph taken in the tuxedo he wears to hold event auctions and holds his gavel in “closed” position. The photograph is active and compelling, and you can’t resist his charming smile. All the Buzz designed this one-sheet for Ernie outlining the benefits of hiring him: He was fun, he was entertaining, and he had proven he could raise money. All things desired by the organizers of benefit auctions. He took it to the next level and founded Blacktie Benefit Auctions. Ernie began mailing out this one-sheet to area non-profit organizations, charities, fund-raising coordinators, associations and more, and quickly was booked solid. 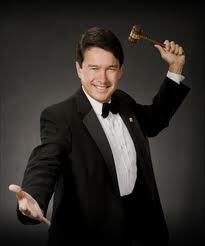 He is now the Number One choice for charity auctioneers and dominates his market. Here’s our shameless plug for Ernie’s exceptional auctioneering style. If you’re holding a benefit auction in the Richmond, Virginia area, contact Ernie Rogers at 804-327-9090, ernie@blacktiebenefitauctions.com or www.blacktiebenefitauctions.com. For copywriting, design, branding or public relations, we’d love to work with you. Contact All the Buzz.